Petra tou Romiou, meaning Rock of the Roman, is famed as the birthplace of the goddess Aphrodite. Also known as the Petra tou Romiou, Aphrodite Rock is one of the many beaches found along Cyprus’ coastline. The narrow beach is an ideal holiday destination for tourists and, unlike other beaches, it is a pebble beach. However, what makes the beach truly exceptional is that it is home to a legendary sea stack known as the Petra tou Romiou. The sea stack is situated along the road connecting the cities of Limassol and Paphos. The literal translation of the sea stack is “Rock of the Roman.” The sea stack exhibits natural beauty, as it stands amidst crashing waves of the Mediterranean Sea and as a testament to its beauty, the sea stack is also known as Aphrodite’s Rock. The name is derived from ancient Greek mythology which indicates that the sea stack was the birthplace of the goddess of love, Aphrodite. The mythological history of the Petra tou Roumiou makes it a popular tourist destination in Cyprus, drawing in thousands of visitors from all over the globe. A local legend has it that the goddess of love and beauty blesses anyone who swims around the Aphrodite's Rock three times with true love, eternal beauty, fertility, and eternal youth. However, the turbulent conditions of the sea in the region discourage visitors from testing the legend. Rock climbers are instructed not to climb the sea stack as a show of respect to the historical and cultural significance of the Petra tou Romiou. However, visitors can sample authentic Mediterranean cuisine served at the restaurant that is located near the sea stack. 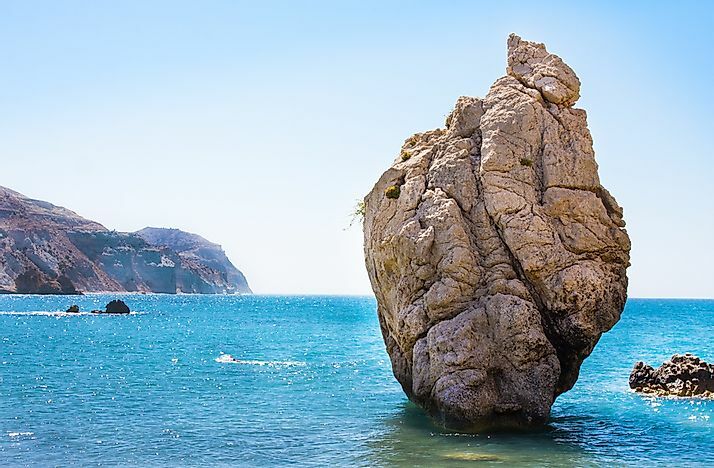 There is a tourist pavilion established at the coast that allows visitors to marvel at the stunning beauty of the Aphrodite’s Rock in the background of the expansive Mediterranean Sea. A short distance away from Aphrodite’s Rock stands another legendary geological feature, the Aphrodite Hills.